The original University Avenue location opened in 1984. Mamasan’s opened for business in 1984 in the modest confines of a converted donut shop. Located in the heart of Rochester, New York’s cultural district and minutes from the headquarters of Kodak, Bausch & Lomb and other major corporations, the restaurant began serving the lunchtime crowd and quickly developed a loyal following. Customers enjoyed the unique flavors of the Vietnamese and Thai cuisine served at the restaurant, the first of its kind in Rochester. The original building at 309 University Avenue was remodeled to include greater seating and increased parking, much to the delight of Mamasan’s fans weary of parking shortages in downtown. 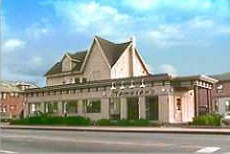 In 2003 Mamasan’s opened a second location, Mamasan’s Noodle Caboodle, on Monroe Avenue in the town of Brighton. Featuring designs and artwork created by local artists, Noodle Caboodle took a fresh, modern approach to the dining atmosphere while retaining the same quality and flavor known to its loyal customers. The University Avenue location eventually closed, but in 2010 Mamasan’s Noodle Cafe was opened in the city with the intent of featuring a more modest menu to the residents, employees and students of the busy Mt. Hope corridor. Offering soups, salads and other small dishes, the Noodle Cafe served its customers a slice of the home-cooked goodness expected of the main restaurant until closing in mid-2012. Today, in spite of its success, Mamasan’s remains a small, family-run business. The friendly staff greets regular customers by name and often remembers their favorite dish. And during its busiest hours, when the restaurant is buzzing with activity, there’s a sense that this is the place to be. The restaurant has become a place where celebrities and regular folks dine among each other while many customers travel from great distances, all sharing a common goal: to eat great food. The size and shape of the restaurant may have changed over the years, but the focus has remained the same: provide a casual, friendly dining environment for guests, and let the food do the rest. Satisfying the tastes of Mamasan’s guests – it’s just business as usual.